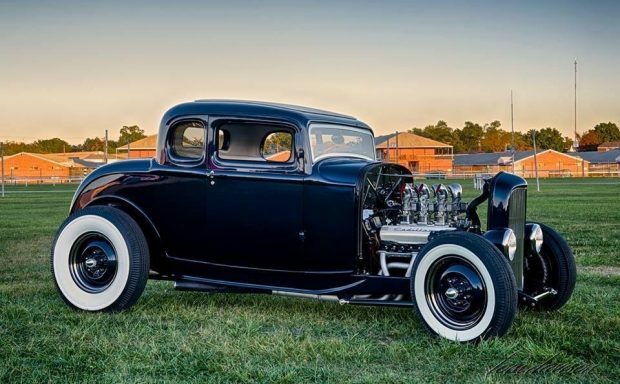 If you have always wanted a Hot Rod like the one here, you may need to make several decisions that could be unpopular. For example, you build a ’34 Ford then drop in a newish Chevy 350 engine. Why would anyone do that? Easy. It’s simple and there are a lot of 350’s around. Okay, call me a purist but I am one of this those guys that want to see a Ford engine In a Ford and Chevy engine in a Chevy. I have noticed at least in my life when I take the so called easy route on something it bites me somewhere else. Hence, if I were to throw a ton of money down on a ’32 Ford Model B by golly that sucker would have a Ford power plant. I mentioned to all you readers I have long considered dumping hard earned money to build a hot rod. I had my chance last fall. I found a 31 Ford Model A that was black and had the original little four cylinder engine. The guy wanted $8500 but I talked him down to the $5000 price point. However, I have a Model A right now being restored so I would have had to buy this one for 5k and then sit on it for a year. Then, when the first one was done I would commission the second one to be hot rodded out to a 31 with possibly a 351 M or 351 W engine. But that meant sitting and waiting for a year while the first was being done and then starting all over again only this time building a completely different car. I had a ton of reservations about this so I reluctantly passed on the deal. Now, the first model A is still being done and all the wiring was just torn out of it so the car can be completely rewired. It will be done professionally and correctly. We found the car running but some of the wires were original, brittle and some in awful shape. Some of the wires were literally tied together. Period. So, with the second car on hold forever it got me thinking about the amount of people who do these engine swaps and the reasons why. I don’t get it and I don’t like it. Just like I don’t like when someone buys a Chevy or GMC AD truck (47 -53) and the first thing they want to do is swap it to a S10 or Mustang II frame. Why? It’s easy and gives them the opportunity to add disc brakes, power steering and a list of options not available with the original frames. With my Model A except for a very few items the car is totally original and a daily driver. It should be done within the next 45-60 days. Then it will spend another 30 days or so being shaken out on the road before it is delivered to me. So, you learned a bit about me today. I like original and love real patina. Not the fake kind people make today. Add in the comment section what you like and why. Nobody’s wrong or right. It’s just opinions and I would love to read and reply to as many as possible.